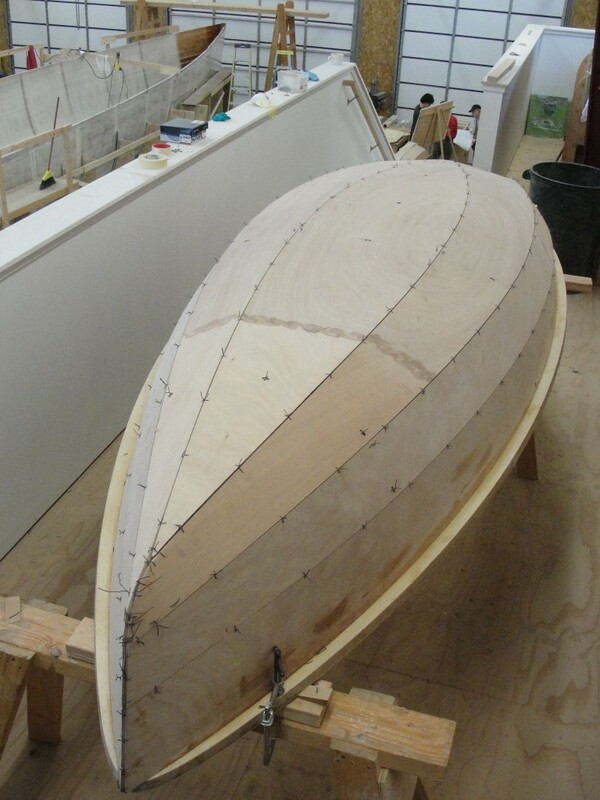 We are please to report that the NW School of Wooden Boat Building is building a PT Eleven nesting dinghy as part of their contemporary boat building program. It is being built in their newly built, on campus facility, the Jeff Hammond building, especially designed to serve as a workshop for larger projects. 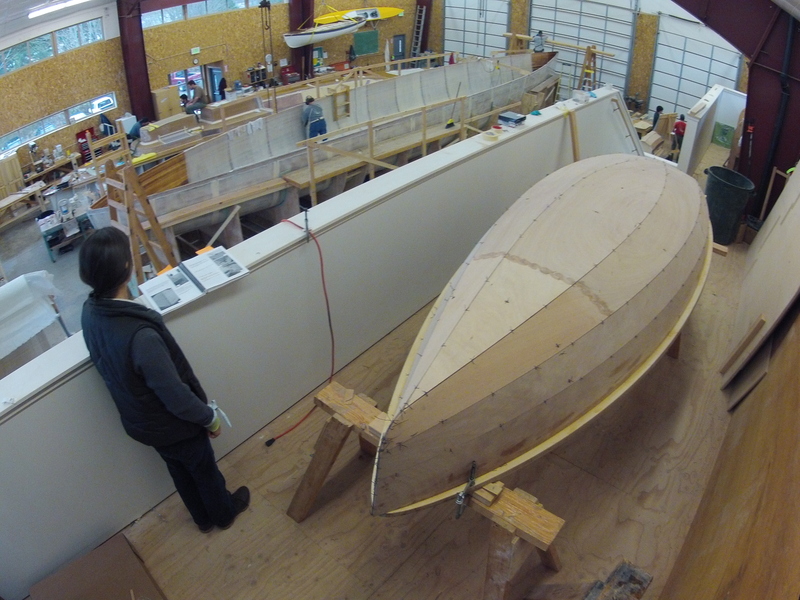 The boat school students are working the Sliver project; a 62foot, Bob Perry designed super sleek, day sailor. Take note that the first photo is taken with an extremely wide angle lens. The boat in the background really is 62ft long. The PT Eleven is being built along side the Sliver project. When completed, it will be for sale. If anyone is interested in purchasing a completed PT Eleven, they should contact Bruce Blatchley at the school. (see above NWSWB link) Russell says they are doing a really clean job so far. Hello All,.. I am back at work after 3 weeks out of the country. I was visiting family and snowed in up in the black mountains of southern France... far from boats...but I also spent time investigating the logistics of making our kits easily available to our European followers. I am a little bit closer to a viable solution. With our limited budget, it all takes real figuring and coordination. One thing that is clear, is that in order to keep shipping costs low, being able to ship at least 2 PT Skiff kits or 5 PT Eleven kits at once reduces the cost for each buyer dramatically. Ocean freight is calculated with a minimum volume so shipping one kit or 5 is nearly the same price. Import duties and clearance fees are being checked into in France and should provide a basic idea for most of Europe. There have been discussions about having kits cut in Europe but we find this to be more complex. It simply is not possible at this stage to have someone in Europe make all of the parts. Besides the fact that our kits have parts cut from 5 different thickness of plywood, there are lumber, carbon, fiberglass, and stainless steel specialty parts. We will avoid any kind of fractured production ideas. Our quality expectation is very high and it will be a good while before we have all the glitches worked out so that someone else could reproduce our kits to our standards. On another note, we will have a PT Eleven on display at the NW Maritime center symposium happening here in Port Townsend on March 16, 17, & 18th. This cruising theme event has a limited number of tickets available so if you think you would like to attend, follow this link and get more information. The presenters scheduled promise to make this a very interesting weekend. 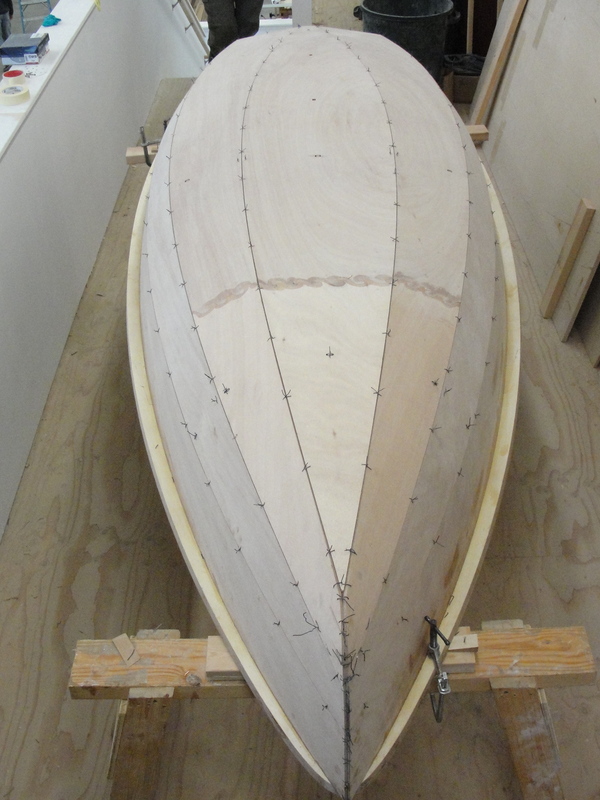 We are nearing completion of the current PT Eleven nesting dinghy, which has been a bit on the back burner. Russell has had other projects demanding his attention. Symposium participants will be able to take it out for a row at various times over the weekend. We have lots of posts in preparation so we hope you will stay tuned. Black Mountains farm in one of the coldest winter snaps in 60 years.